After nearly a decade of significant growth, DC Group is redesigning its current space to accommodate increased business and employment. Rendering of the new DC Group headquarters. DC Group initially rehabbed the dilapidated building in the early 1990s when it moved into the space. Now it’s completely redesigning the headquarters, adding 25,000 square feet of office/warehouse and a new 86 stall parking garage. DC Group has seen robust growth in recent years. The company has appeared on Inc.’s 500|5000 for six consecutive years. It serves 20 percent of the Fortune 500 and has a 95 percent contract renewal rate. The workforce has grown from 41 employees to 140 employees. The Minneapolis Chamber of Commerce recently recognized DC Group with the 2014 Best in Business Award. The company also received Inc’s Higher Power Award from Inc. in 2012 for contributions to the economy. The company was considering other locations for its headquarters, including new suburban developments. 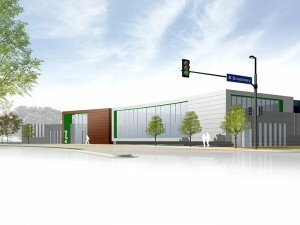 But, after working with the city of Minneapolis to secure tax increment financing, receiving support from the Minnesota Department of Employment and Economic Development (DEED) in the form of employment grants, and getting help with environmental clean up from the state, DC Group decided to redevelop its existing building. “Minneapolis is an innovative city that’s a perfect place for companies like DC Group,” said Minneapolis City Council President Barbara Johnson, who worked with the company to lay out a financing plan. The expansion plans call for significant aesthetic upgrades to the site and streetscape through a bold curved design, expansive windows, modern wood and metal cladding, and a roof deck. On the inside, the renovated building will include long-term bicycle storage and locker rooms and facilities to encourage use of alternative transit. “We’re pleased that the company will remain in this community for years to come and will continue to contribute to our growth,” noted Ward 5 Councilman Blong Yang. The company was also highlighted in a feature that appeared in Twin Cities Business Magazine May issue. In this article Frank told the story of his company’s growth and his personal philosophy for business success. Find a downloadable copy here. DC Group also authored an article for Mission Critical about the need to evolve from “run until parts failure” to predictive maintenance. The article gives facts and hard figures about the cost savings of a predictive approach, take a look or download your copy.